Help your business take-off by migrating it to the online cloud. Simplify your business. With loads of apps designed to reduce admin time from easy shop builder to internal email. Add content, manage users and promote your site with no training required. 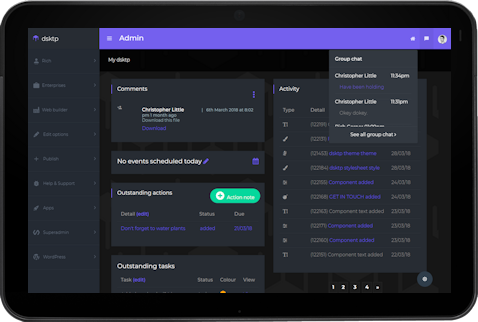 Invite your team and clients to work on projects, save and track progress. Your dsktp is backed up twice a day, with multiple levels of security access. Although most of dsktp is pre-built for you, it's flexible enough so we can tailor it to your needs.